One of the new techtoys I acquired on my recent trip was a new mini tripod. I have an el cheapo model with very wonky legs so am delighted with this sturdy little replacement. When I conduct GeniAus Hangouts on Air from my kitchen (so I can have a wired connection to the internet) I perch my webcam on a pile of coookbooks. 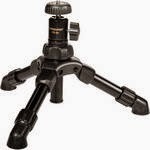 When next I hangout I will be using my new Vanguard VS-86 Table Tripod with Ball Head. I am most grateful to Mr GeniAus who braved the freezing conditions in New York City to fetch this item from one of my favourite stores, B&H Photographics. If you are suffering from Tripod envy you can order one online from B&H - they even ship to Australia.